"Have you ever seen - or thought you saw - a fairy? Perhaps you caught sight of a tiny wing glittering in the sunlight? Maybe you heard the sound of tinkling laughter coming from the garden? If so, you may have been lucky enough to glimpse a magical Flower Fairy." The garden can be such a magical place. It's the perfect place for fairies to live. What fun it is to provide them with their own special place in the garden. Perhaps they would enjoy a bench to sit and enjoy the garden or maybe a pond to take a dip in on a hot day. I thought the fairies might enjoy their very own green house. This little bunny is one of several animals that live with the fairies in the garden. A bench looking over the pond. This little turtle makes his home in the fairy garden pond. Who doesn't love a tire swing? At this time of the year I have lots of annuals blooming. I actually use very few bedding plants. Most are grown from seed or overwintered as cuttings. I like the taller plants you get when growing from seeds compared to purchased bedding plants. I grew these zinnias to use at my son's wedding. Their color is guava. Red salvia and red zinnias in the red bed. Clematis 'Arabella' hasn't stopped blooming since spring. Salvia 'Black and Blue' along with a small celosia. Lot of zinnias in the garden. I thought this basket of veggies and flowers from the Potager looked so pretty. (pronunciation: puh ta zhay) a garden that combines both edible and ornamental plants; a vegetable garden that is utilitarian in nature but designed with beauty in mind; much like an English kitchen garden, but often formal and symmetrically designed in the French fashion. A potager was a solution of sorts for me. I was quite into flower gardening when my son left home and left his vegetable garden in my care, I was not very excited about it. Over the course of several years I begrudgingly spent time working in this garden. Sure I loved all the fresh vegetables it provided, but it just seemed like work to me. Unlike the flower gardens which I enjoyed tending. This was a problem I decided surely could be solved. What I came up with was a potager. Just the name sounds interesting. It could be beautiful and fun but still functional. My potager is small in size but produces exactly what the two of us can eat along with a cutting area. I grow quite a variety but in small quantities. I knew I wanted a formal design and since I love old brick I decided to use that. From earlier in the summer you can see the rectangle shape intersected by two paths with a half arch on the short ends. Cilantro is one of the herbs in the potager. It looks quite pretty in flower. Zinnias are a favorite flower for cutting. This ornamental pepper 'Black Pearl' edges the cutting garden. In the background are the purple grapes. A large urn is the centerpiece of the potager. Bloody Sorrel or botanically know as Rumex sanguineus is a pretty herb. The arbor at one end has a green variety of grapes on one side and purple on the other. Marigolds are both edible and just belong in a potager. The fence holds back the tomatillos. Alpine strawberries along with a salvia argentea that seeded itself there. Why bother with containers when you have lots of room to plant in the ground? After all they need all that watering and fertilizing. 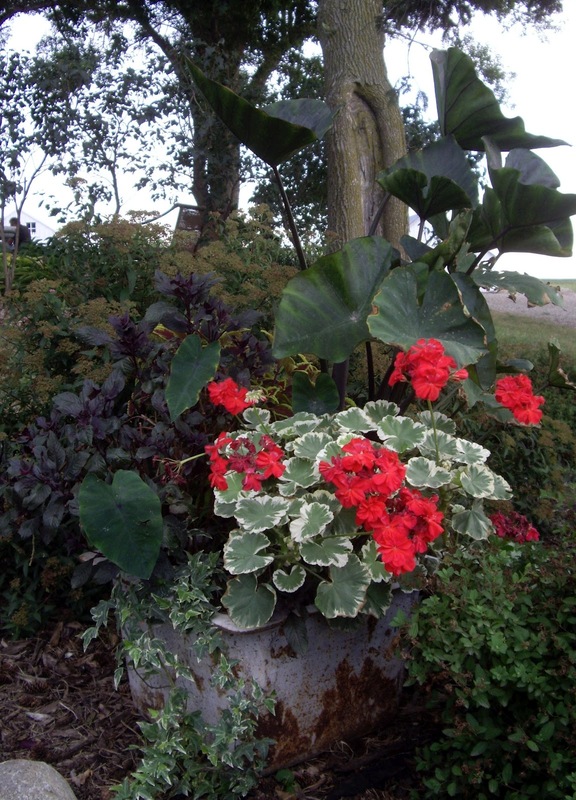 There are lots of reasons to include containers in the garden. One of the reasons is that they add height. Containers can be raised up or hung, bringing it to eye level and adding another plane to the garden. It is also a great way to add color and plants on a patio or by the front door where there may be concrete or some other hard surface. You can also move containers around to spots that may not have much going on at the moment. Then there is the container itself, you can make quite a statement with just the container. I'm particularly fond of urns and love cobalt blue containers. I also like containers that are rustic or repurposed. Anything from an old watering can, to a chicken feeder, to an old lamp as you see below. Furthurmore there are so many great annuals that work well in containers. Some of the containers in my garden have a number of different plants in them and then there are some that are mono-pots. 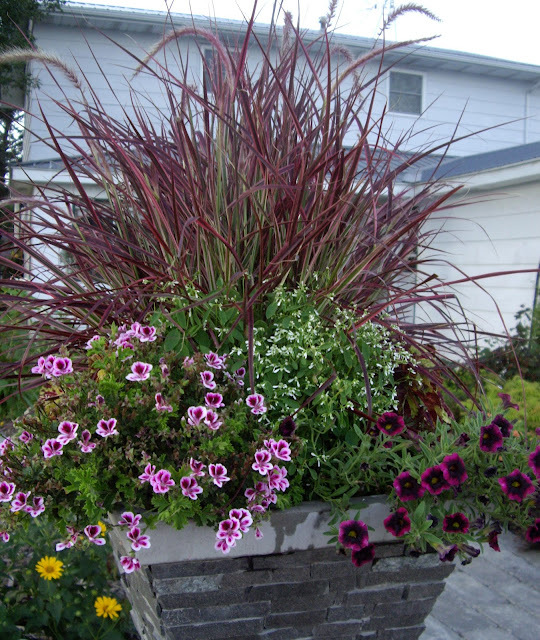 Containers are a good way to change things up every year. This old stand lamp certainly brings the planting to eye level. This old sink has been repurposed as a container. There are two pillars at the end of the front walkway. I plant them up differently each year. I love urns! This one is the centerpiece of my potager. This one is by the front door. Anything can be used such as this old hollow stump. My husband gave me this one for my birthday. Now to find the perfect spot.